Are you worrying about what is going on in Nigeria? Worrying about the crisis in the World? Worried because you're still job-hunting? Worried about job security, paying the rent or the mortgage, success, investments (or lack thereof), whether you'll be promoted or not? Have you laughed yet today? Take a break today and laugh. Plan to relax. 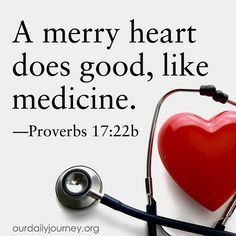 A merry heart does good, like medicine. When you make merry in your heart by ignoring the problems around you and allowing the Father of creation to be in control, you automatically get healed. ''I work with a lot of leaders. And one thing I’ve found is that many times they take themselves much too seriously. Of course, they’re not alone. I meet people in every walk of life who have too much doom and gloom in their attitudes. They simply need to lighten up. No matter how serious your work is, that’s no reason to take yourself seriously. If you tend to take yourself too seriously, give yourself and everyone else around you a break. Recognize that laughter breeds resilience. Laughing is the quickest way to get up and get going again when you’ve been knocked down''. Therefore, no matter how big the problem look, see the bigger picture by looking unto Jesus Christ the author and finisher of our faith. God is bigger than that problem, Relax. There is light on the other side of the tunnel and after the turbulent night, joy await you in the morning if you can let go of whatever negativity occupying your thought. As Nigeria music star Lagbaja put it ''show me your 36, no matter condition, feyin re'' it means, smile no matter the condition. Always laugh over any unpleasant situation and work a way out by being positive.